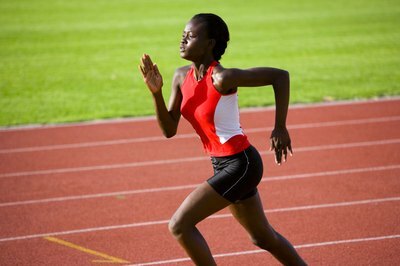 Sprinting is one form of cardio exercise to increase thigh size and power. Choosing the best cardio exercise for you is like shopping for a new set of clothes for the spring: It must fit your preference and your purpose as well as your goals. Whether you are training for the marathon, soccer or sprinting, all forms of cardio involving your lower body will work your thighs, too. If are you new to exercise, focusing on steady-pace cardio is a appropriate place to start. It gradually develops your lower-body muscular endurance so that you can eventually take on the high-intensity cardio with confidence. Steady-pace cardio includes cycling, jogging, climbing on a stair machine and training on the elliptical machine. At a steady heart rate of 45 to 55 percent of your maximum intensity, you can sustain the activity for 30 minutes or more, depending on your fitness level, says athletic coach Vern Gambetta, author of "Athletic Development." Rather than doing one exercise for 30 minutes straight, do three different cardio exercises for 10 minutes each. For example, jog on the treadmill, pedal on a stationary bike and climb the stair machine for 10 minutes each. Your thighs and the rest of your lower body will get a continuous workout while getting different flavors of movement. Cardio training doesn't always mean that you have to jog for an hour on a treadmill like a hamster on wheel. In fact, high-intensity interval training, or HIIT, can both improve your endurance, strength and recovery time altogether as well as maximizing the number of calories you burn in the least amount of time, says the IDEA Fitness Journal. It also offers a lot more selection of exercises than steady-pace cardio. Although you can use free weights and other equipment to train, you can use your body weight for a high-intensity thigh workout. For example, do the following exercises for 20 seconds each: body-weight squat, power step-ups, front or side lunges and squat jumps. Rest for one to two minutes before repeat the series two more times. You can adjust the challenge of HIIT by changing the exercise duration, rest period and the type of exercise that you do. There are many types of cardiovascular activities for your legs, which don't always involve being in the gym. Hiking, capoeira, muy thai kickboxing, salsa dancing and similar activities all work your thighs and lower body in ways that most tradition exercises do not train. You may find that these activities are so fun that you forget that you are actually exercising! Some people can get carried away with doing too much cardio, whether it is low-intensity or high-intensity. Overtraining can lead to mental exhaustion, long-term muscle soreness, lowered immune system and a higher risk of injuries, says exercise physiologist William McArdle, co-author of "Exercise Physiology." Give yourself at least 24 hours of active rest between training. This doesn't mean that you sit and surf online all day. Do some activities that help your recovery, such as meditation, yoga or a brisk walk in your neighborhood. How Often per Week Should Women Do Cardio?